Quality, comfort, security, and efficiency are some of the characteristics which differentiate this hotel. Copa Sul has 88 rooms, and excellent restaurant, room service, a convention center, and a team of qualified professionals to serve the guests. All rooms have air conditioning, mini-bars, remote controlled satellite TVs, music, phones, and individual safes. The hotel restaurant is open for breakfast lunch and dinner. The business center is equipped with the latest technology and broadband access. When would you like to stay at Copa Sul Hotel ? 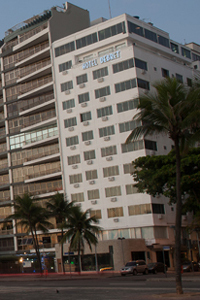 1) Rates at the Copa Sul Hotel may not be valid during Carnival, New Years, Easter and other special dates.